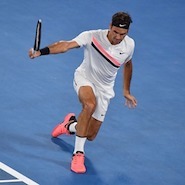 On Sunday Roger Federer expects to claim his sixth Australian Open as well as his 20th career Grand Slam title when he faces Croatian Marin Cilic in the final. Here are three reasons why Federer will be able to get his hand on the coveted trophy. 1.- Because of his dominant head-to-head record (8-1) over Cilic. The Croatian’s game simply doesn’t match up well with Federer’s game. This was evidenced in last year’s Wimbledon final. Federer’s consistency was too much for the big Croatian who had no answers as he was dragged around the court as the Swiss player took control of the match. 2.- Federer’s serve consistency. Despite not being a massive player in terms of physique and height his serve is quite efficient as he has the third best serve rate in the world (300.5) only behind American power server John Isner (316.9) and Croatian Ivo Karlovic (313.9). Federer can generate a lot of power into his serves but it’s more his exquisite precision hitting the lanes time after time what makes it so lethal. Cilic is a much bigger man and should be the best server in this match, and at times he is, but he fails to be consistent enough and as result, his serve rate of 284 is ranked 11th in the world. Unless Cilic brings his best serve to the game Federer has the skills to pick his serve apart and take over the match by returning the ball to Cilic’s backhand and then making him run after well-placed balls. 3.- Federer’s under pressure rating. This is where Federer sets himself apart from the rest as the ATP has him ranked number one in the world with a rating of 259.1 in front of fellow Swiss player Stan Wawrinka’s who own a 254.9 rating. Federer has repeatedly been under huge amounts of pressure, yet he finds a way to come through and win. Federer has a definite mental edge against Cilic. Twice in the last three matches, he started trailing against the Croatian and both times he managed to come back and win. The most memorable occasion being perhaps the 2016 Wimbledon quarterfinals match where Cilic went up two sets to none only to let Federer mount an epic comeback and win the last three sets. Federer has also done this against tougher opponents such as against Rafael Nadal in last year’s Australian Open final where he was a break down in the final set but anyway found a way to win the match. Cilic’s under pressure rating, on the other hand, is 199.9 which ranks a measly 56, which shows he is prone to crumbling quite often under pressure. He’s not good closing matches and repeatedly falls apart mentally at the latter end of them. Due to all these reasons expect Federer to clinch his 20th Grand Slam title on Sunday in what will probably be a four-set victory where Cilic might get to force a tiebreak or two at the most.